Perth’s rambunctious punks The Decline are psyched to announce they are grabbing their decks and hitting the highways of Australia for another national tour. 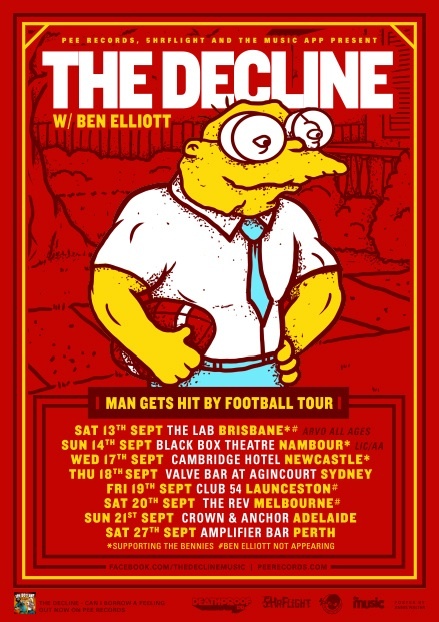 Man Gets Hit By Football will do the rounds in all major cities as well as Nambour and Newcastle and will introduce solo singer/songwriter Ben Elliott to new ears as he embarks on his first ever tour. The Decline’s hometown performance on AFL Grand Final day will be recorded in all its raucous glory for use on an upcoming release. 2014 has seen The Decline do anything BUT what their name suggests. The quartet has already lapped the country once in support of their acclaimed new EP Can I Borrow A Feeling (are you sensing a Simpsons theme here?). The boys also whipped crowds into a frenzy at Perth’s Soundwave Festival earlier in the year when their melodic pop punk gems opened the Western leg of the tour. With more than eight years in the scene, and two studio albums deep, The Decline are inching towards becoming more than just a recognisable and reliable name; they’re becoming a draw card. Prep your eardrums for a tickle this September and catch Australia’s favourite skatepunks at one of the following shows.